How can a few simple ingredients cause so much stress in the kitchen? 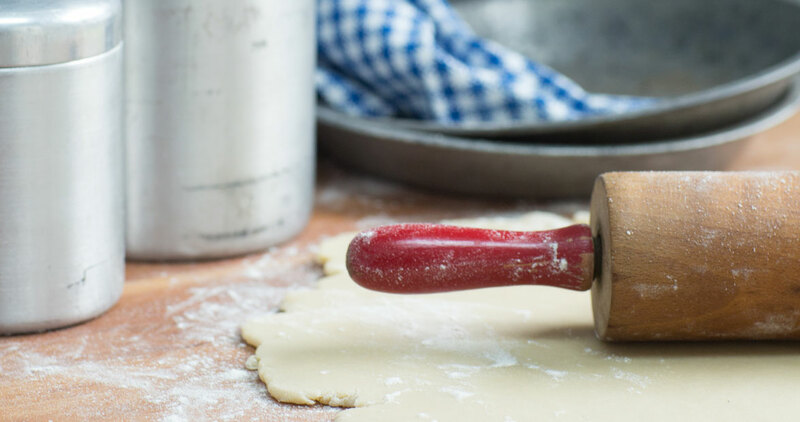 A celebrated baker and restaurant owner shares her secrets for foolproof pastry. I love pie. All pie. But I didn’t grow up eating it. I was brought up on bagels and babka. My maternal grandmother, a powerful matriarch I called “Bubbe,” was a marvelous Eastern European baker. At her side, I learned the importance of a light, deft touch, and that the real secret to superior home baking is a solid dose of caring and love. When I married into a family of legendary Alamance County bakers, I quickly learned that a smile and a well-crafted pie were a welcome addition to most any social occasion. I made it my personal mission to master the Art of Pie. After contributing a couple of blueberry-blackberry efforts to my first family reunion, I was deemed “all right.” Persnickety Gran Louise — known for her chess pie — even told me that I had “the gift.” High praise indeed from a woman who understood intuitively that a perfect pie relies on a symbiotic relationship between crust and its contents. We tend to think that what’s inside a pie makes or breaks it. But, in my experience, no amount of delicious filling can overcome a tough or soggy crust. Which is why I, like bakers before me, initially suffered from Crust Anxiety. But I overcame it when I realized that dough-making is a highly tactile process, one that you can’t begin to understand until you actually begin to do it. Ideally, every novice baker should have a BBF (Baker’s Best Friend), someone who can demonstrate and oversee the first few attempts at pastry dough. The steps themselves aren’t difficult, but fledgling bakers are tentative and they second-guess themselves. Bubbe was my first BBF. She taught me that with a sturdy rolling pin and a little practice, making any type of dough becomes second nature. Over time, I learned how to be organized and relaxed about baking, too. Eventually, I developed the confident, sure motions that I had witnessed at the elbow of Bubbe. Sometimes I imagine my own granddaughter and future daughter-in-law at my side, watching, learning, practicing their baking skills, one pie at a time. The ingredients may be simple, but the techniques for combining them are crucial. These days, I bake primarily all-butter crusts using American-style, unsalted butter (not high-butterfat European-style butter). It is critical to work with well-chilled butter and very cold water. A food processor is the quickest way to cut in butter and keep the ingredients cool — the key to a tender crust. But doing it by hand certainly works, too. Put flour, sugar, and salt in the processor and pulse to blend. Add butter and cut in using a series of quick pulses — do not overprocess! Butter pieces should be somewhat irregular in size, none being larger than a large pea. For a low-tech method, rub well-chilled butter in with your fingers or cut it in with a pastry blender. When the butter is cut into the flour, transfer the dough to a large, chilled stainless steel bowl. In several additions, gradually stir the water into the mixture using a fork and a quick scrambling motion. (You may not need all the water, or you may need an additional teaspoon or so.) The mixture should be evenly moistened and come together cleanly when lightly squeezed. It should have the consistency of Play-Doh: moist, but not wet or sticky. Gather dough into a ball, divide in half, and flatten into two rounds. Wrap each in plastic film and refrigerate for a minimum of 2 hours, or up to several days. Individual rounds may be frozen for up to 2 months. Karen Barker is the award-winning pastry chef of Durham's late and legendary Magnolia Grill. You can find Barker's desserts at her son's restaurant, Pizzeria Mercato, in Carrboro.